In 2009, Gartner released the Magic Quadrant for Web Hosting and Hosted Cloud System Infrastructure Services. 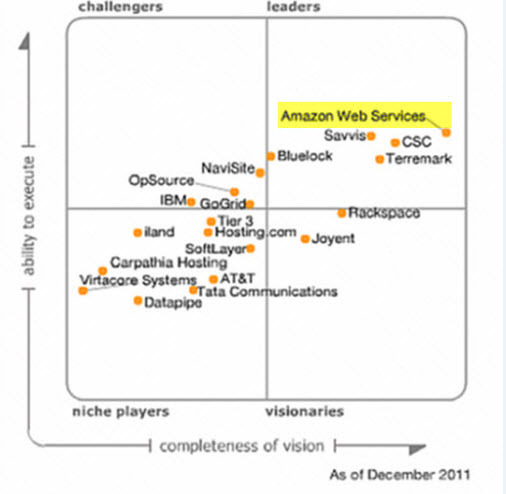 At that time, Amazon Web Services, AWS for short, appeared as one of the Visionaries in the space. I have to wonder, if at that time, the team at Amazon realized that it would only take them 3 short years to become the de-facto leader in the space, and that in just 6 years they would account for more service capacity than everyone else in the Magic Quadrant combined? 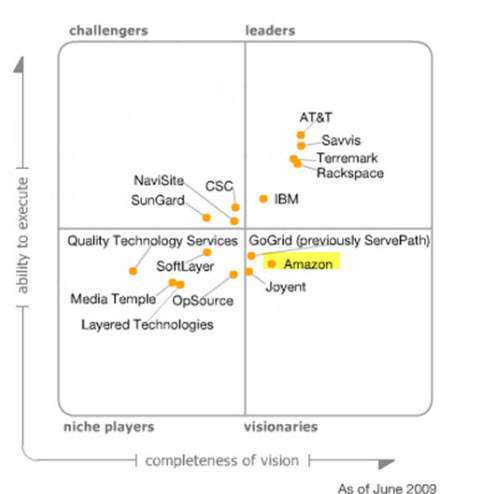 An additional point I find interesting about the AWS journey is when I look at the competative organizations and companies whose pedigree and execution capabilities would put them in the category of “Titans of Industry” in 2009, many were not even listed in the Magic Quadrant only 3 short years later when AWS took ownership of the space. It’s also interesting to look at the niche players who came aboard, and then also disappeared, either going under due to competition, or being purchased and integrated into one of the larger groups. An immediate takeaway, is that this is a dynamic and highly competitive space. So Visionary to Leader in 3 years is a massive accomplishment for any company, but this journey also needs additional context. At the time AWS entered the Magic Quadrant, AWS had been a product with over 180,000 developers working with the system for several years. They had the financial might of Amazon itself to devote resources and infrastructure to. Still, they went full Conan and crushed their enemies, saw them driven before them, and, well you know the rest. All this said, why am I prattling on regarding Gartner and Magic Quadrants? Well as I write this the company I work for, SimpliVity has been announced as part of the Gartner Ma gic Quadrant for Integrated Systems. Now I won’t go into great depth on what an Integrated System is, my buddy Ron Singler already has and Matt Vogt has gone one step further to lay out the inclusion criteria as well, but what I do want to delve into is why I believe this is a very important first for a young company like SimpliVity, and to provide a little more context to what the 4 squares mean. For those new to the world of Gartners Magic Quadrant, the image to the right, while a little tongue-in-cheek, is for the most part accurate. When the Magic Quadrant is released you are either on it, or you are not. There is one small exception here, and that’s the “Cool Vendor” space, which is outside looking in, but relevant enough to have an “honorable mention. In our case, it would have been a good thing for a company that had only been shipping product for 6 months to be mentioned in the “Cool Vendor” spot, it would denote that there was potential enough to capture the eye of the analysts, and then wait a year to see whether the company made it onto the chart. 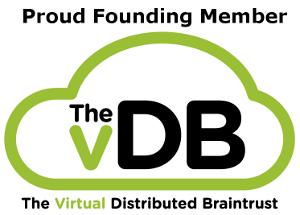 As it turns out SimpliVity made the Visionaries category (Click for full report) for Integrated Systems. The one aspect of this that is truly remarkable, is that I cannot recall any company that had only been an active participant in the marketplace for 6 months being included in the Magic Quadrant. When I came on board in April of 2013, only 5 months before the Gartner quadrant was analyzed, there were roughly 70 employees at the company. At the time of analysis that number was closer to 100, today that number is over 300, and that kind of growth is a strong stepping off point for the journey to leadership.